CSUSB had a need to standardize all of their campus websites onto one common platform that would be able to grow with their needs over time. Ideally CSUB would be able to maintain a central distribution as a starting point for new site across campus. 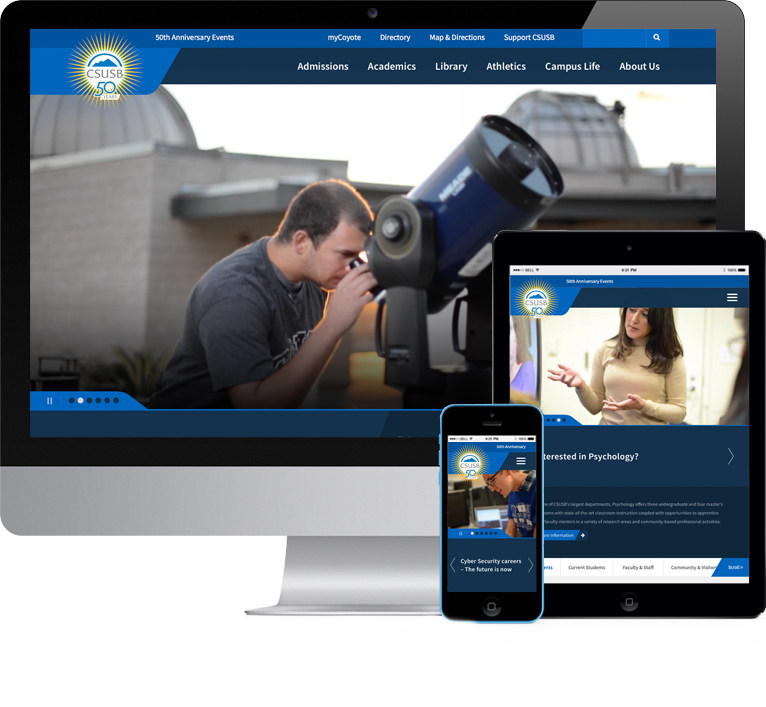 CSUSB also needed a complete design overhaul for their brand and needed the new sites to be responsive. In addition, CSUSB needed to integrate with third party web services for searching web results, faculty and staff profiles and events. Main Campus site build from distribution. Central site for web searching, faculty and staff profiles and events. Drupal Connect worked closely the the CSU Bernardino IT team to identify the main components of a distribution. The result of our collaboration produced a custom Pantheon distribution with a top level menu and footer, custom sub level menus, custom content types, webforms, publishing workflows and the ability to consume alerts and events from a central location. Drupal Connect’s expert themer worked with the design team from CSU Bernadino to implement a new mobile responsive theme with break points for desktop, tablet and handheld devices. Drupal Connect provided documentation and communicated with the CSUB team on how Bootstrap was developed with Sass in order to insure CSUSB could support the theme and provide modifications as needed. Drupal Connect developed a theme that exceeded CSU’s compliance for accessibility guidelines. In addition to the distribution codebase and theme Drupal Connect also developed the main campus site from the distribution. This allowed both Drupal Connect and the CSUB team to work together and test how well the distribution allowed for spinning up new sites and incorporating new features. One new feature included in the main campus site was a homepage slideshow allowing for images and video. The slideshow had to be compliant with CSU accessible guidelines, render properly on different devices, and transition smoothly between images and video. Drupal Connect also provided a solution for a central web search, faculty and staff profile and central events management by developing a site to consume and manage all three components. This central site uses the Google Search Appliance providing the ability to aggregate content across the university into a single search. Drupal Connect also worked closely with the CSUB team to develop a custom API to connect to and pull in complex Faculty and Staff profiles on a regular interval. These profiles would also be returned in search results. Finally Drupal Connect worked with the CSUB team to identify the best way to manage events in this central site and expose these events through a API for others across the campus to consume. The end result was a search form added to the main distribution that delivered searches to the central search site returning grouped results for web content, faculty and staff profiles and events. Drupal Connect was very active in how we communicated with the CSUB team allowing for very open conversations, troubleshooting and implementation of solutions that both teams understood. The end result is the deliveries of a main distribution on Pantheon for a single platform and the development of the main campus site from this distribution. The development of a responsive mobile theme for the main distribution and main campus with accessibility compliance. Drupal Connect also architected and delivered of a central site to manage and return results for web content, faculty and staff profiles and events with API being consumed and exposed. The CSU Bernardino team was very happy with our work and hired us for other initiatives they had.